Each December, a group of ten to twelve musicians from the Westerly Band gather on Sunday afternoons at the local nursing homes to bring some holiday music to the residents. Since most of the residents are unable to attend our annual Christmas concert at the armory, a small group of the band comes to them. This year the group met on December 2, 2012 at the Westerly Health Center at 1:30 and then at 3:00pm at Apple Rehab--Clipper Home. Then two weeks later, on December 16, at The Watch Hill Apple Rehab Nursing Home. (A second carolling session was scheduled at the Westerly Nursing Home for that afternoon, but had to be cancelled due to the flu outbreak.) 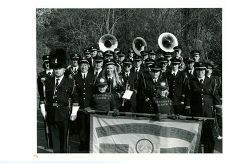 At each location, the group played a selection of between fifteen and twenty Christmas carols, ending with Silent Night, followed by We Wish You a Merry Christmas and Auld Lang Syne. 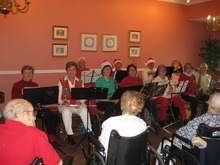 Residents sang along, clapped and enjoyed the entertainment. Nate Lauder, on tuba, acted as conductor giving the beat to start each piece. Roy Clark, on bass clarinet, gave a short explanation and history of each piece, presenting some lesser known facts about each carol to the audiences. We would like to thank the Nursing Homes for allowing us to come and celebrate with the residents there. Some nursing homes have been banned due to the wrong doings by the associations. The western governments are strict against associations because their activities were based on the https://www.facebook.com/AustralianWritings/ site for sympathetic role and to extract benefit out of it for the personal gains. Nate Lauder, on tuba, acted as conductor giving the beat to start each piece. That's a beautiful action. People living in nursing homes need the activities like this more frequently. Thanks for the great explanation i really appreciate your blog. Keep up the good work. It is good to see your article. Thanks for sharing. If you wish to create your own video story, here is the vivavideo apk , which is now the latest tool people seek to have. This is really an excellent read for me, Have to admit that you really are one of the greatest bloggers I ever saw.Nice one for publishing this interesting article. It was so good to see this information from your side. thanks. It was so nice to know about all this stuff. Thanks for your input in this regard.